Merlin and I had a proposal for an anthology that fell through, but that just means we’re bringing it to YOU! Yes, and now it’ll be in color! 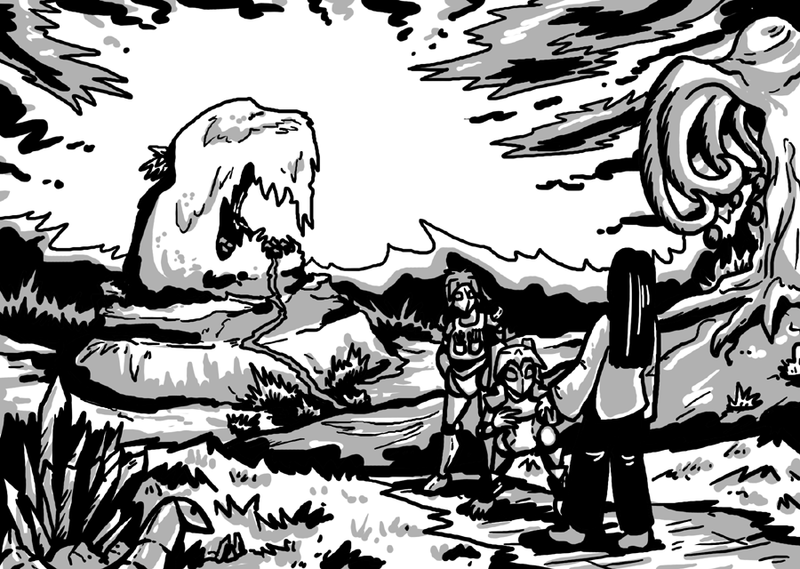 It’ll be a wild adventure of a couple Dragon Doctors characters going on a small quest in the Crystal People dimension, full of strange alien life forms and crystal girls. The comic pages will be viewable early for Patreon donators only (though the rest of you will gain access once it’s done). Should be pretty awesome. What have I been doing? Colorizing a few key old pages, for starters, and also working on the next “My Name Is Sarin” chapter for the end of the month for Patreon donators. There will still be at least three comics this week, starting Tuesday. Just needed 24 hours to give myself time to fix everything and also give you all a heads-up. I love this landscape. I really like the character designs, too. That anthology is missing out like whoa. Spike has no idea how much she’s missing out on. We plan on making a comic so good it’ll make people’s hair fall out. Also, yeah, I realized they were probably going into the janitor’s closet so I added in a mop and broom. What a place for a marriage proposal, right? Haha. First major comic colorized: Chapter 19, Page 15. Yes, Mori has become white even in flashbacks now.